Richard Rosenthal, M.D. is board certified in Anesthesiology, Pain Medicine, Addiction Medicine and Interventional Pain Medicine. He graduated from the University of Utah School of Medicine in 1985. In 1993 he graduated from an anesthesia residency at the University of Texas at San Antonio Medical Center. He is the Founder, President, and Medical Director of Nexus Pain Specialists. Dr. Rosenthal has distinguished himself as a leader in educating and training medical professionals in the fields of Interventional Pain and Regenerative Medicine. He is the editor of the interventional pain section of the widely read journal, Practical Pain Management. He developed a one year pain medicine fellowship which teaches young physicians a variety of skills in Interventional Pain and Regenerative Medicine. Dr. Rosenthal is a master instructor for the prestigious Spine Intervention Society. He has taught physicians in both the United States and Europe how to correctly perform various spinal procedures. He has authored several scientific articles and book chapters on topics in the specialty of pain medicine. He is also involved in clinical research and has served as an expert witness in malpractice cases. His clinic was awarded the Excellence in Multi-disciplinary Pain Care Award by the World Institute of Pain (one of only 4 clinics in the United States to receive the award in 2011). Dr. Rosenthal has been practicing Regenerative Medicine for the past several years. He has acted as Course Director for more than 25 Regenerative Medicine courses and has lectured at national conferences. He specializes in the use of stem cells and platelet rich plasma for the treatment of painful joints, including the knee, hip and shoulder. His treatments are based on a comprehensive approach to relieve pain and improve function. Dr. Rosenthal has lectured on the topic of Regenerative Medicine, especially Platelet Rich Plasma and Stem Cells treatments, for such prestigious organizations as the American Society of Interventional Pain Physicians and the Society for Pain Practice Management. 2012 -Master Instructor – International Spine Intervention Society. With more than ten years of dedication to educational service. 2005-Present. International Spine Intervention Society Education Committee member: I have played an active role on the Spine Intervention Society (SIS) Education Committee in the evaluation and selection of prospective instructors, I have acted as a Course Director. I have also written Emergency Protocol procedures which have been adopted by SIS, and I continue to work on the development of instructional materials and guidelines. Director, Interventional Pain Management Fellowship. I am presently the medical director of an Interventional Pain Fellowship. My responsibilities include instructing fellows through guided readings, didactic presentations, hands on interventional procedure experience, and publication of scientific articles. Ours is the only private clinic providing Interventional Pain instruction in Utah. 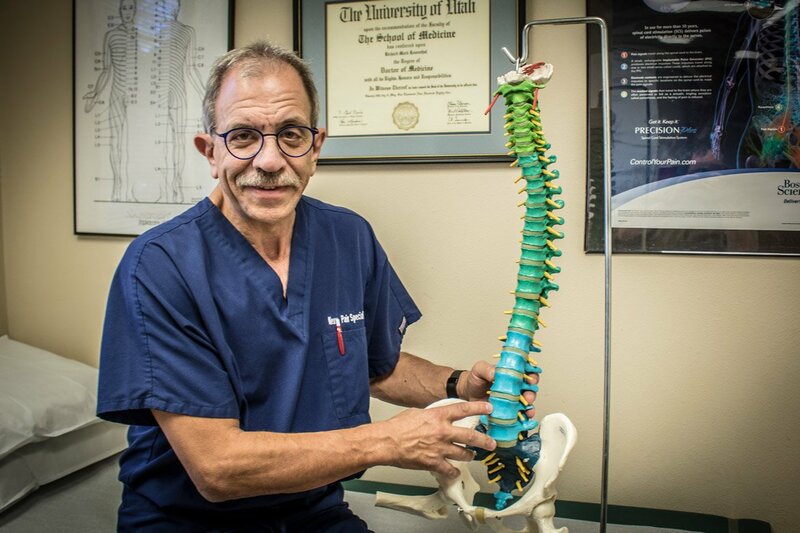 In addition, I am able to provide one or two day instructional clinics for doctors in private practice around the U.S. who come to Utah specifically to learn more about interventional pain. International Spine Intervention Society, Senior Instructor. My teaching involves the training of practicing, board certified physicians in Interventional Pain with the main focus on diagnostic and therapeutic spinal injections, and spine interventions, utilizing fluoroscopy. This includes precise needle placement in and around the spine, as well as the interpretation of fluoroscopic imaging. Editor for Interventional Pain, Practical Pain Management Journal. I provide articles for each monthly journal publication sometimes enlisting the knowledge of other interventional pain professionals. I also act in an advisory position for Interventional Pain issues. Recipient Multi-Disciplinary Clinical Pain Practice Award from World Institute of Pain. The World Institute of Pain (WIP) Excellence in Pain Practice (EPP) Award is an award given in recognition of specific criteria established by WIP and an inspection of the pain center by a WIP representative at the invitation of the director of the pain center. The award is presented in recognition of excellence in pain management and training of physicians, and is granted for a five year period. Consultant, Medical Equipment Companies (Stryker, Boston Scientific, Neurotherm). I am a consultant for medical equipment companies and act as a mentor to proctor doctors. 1. Rosenthal, Richard M. “Radiofrequency Lesioning.” In Pain Management. 2nd edition. Ed. Steven D. Waldman. Philadelphia: Elsevier Publications. 2011. 1331-60. 2. Rosenthal, Richard M. “Pulsed Radiofrequency Procedures in Clinical Practice.” In Image Guided Spine Interventions. 2nd edition. Eds. John Mathis and Stanley Golovac. New York: Springer. 2010. 175-206. 3. Rosenthal, Richard M. “Lumbar Spinal Nerve Block.” In Interventional Pain Management. 2nd edition. Ed. P. Prithvi Raj. Philadelphia: Saunders. 2008. 337-43. 5. Rosenthal, Richard M. “Neurolytic Nerve Blocks.” In Decision Making in Pain Management. 2nd edition. Ed. Somayaji Ramamurthy and James N. Rogers. St. Louis: Mosby. 1993. 216-17. 6. Rosenthal, Richard M. and Gregory J. Merdith. “Acupuncture.” In Decision Making in Pain Management. Ed. Somayaji Ramamurthy and James N. Rogers. St. Louis:Mosby. 1993. 206-07.